Meditation practice is like a muscle – it needs to be used regularly in order to get stronger. We review 6 apps that can help you work some meditation into your daily routine, and start reaping the rewards of mindfulness in recovery. Wouldn’t it be nice to have a personal mindfulness coach to remind you to practice and guide you through it? 6 mindfulness apps that will keep you motivated, stress-free and in the moment during recovery. 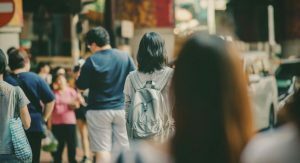 Although it has been practiced in Eastern cultures for thousands of years, it is only recently that Westerners have begun to embrace the incredibly positive effects of mindfulness meditation on addiction recovery. One of the most important effects of mindfulness is stress reduction, which is why it is such an excellent tool in addiction treatment. Stress could very well be ranked the number one relapse trigger because of the wide range of effects it can have on the body and mind. Practicing mindfulness each day will keep you further away from stress and closer to successful, long-term recovery. Despite its wealth of benefits, many people still find it difficult to practice mindfulness regularly – which is when you will start to reap the most rewards. Wouldn’t it be nice to have a personal mindfulness coach with you each and every day, to remind you to practice and guide you through it? We have put together a list of some of the best mindfulness apps on the market today. In no particular order, we have included several apps that offer a variety of features to make it easier for you to find the app that suits you best. Headspace is designed to guide users through 10 minutes of meditation each day. Users report that the guided meditations are very clear and easy to follow. You can stream sessions or download them for later use. Headspace offers a free Take-10 programme, after which continued use requires a monthly subscription. Wildflowers Mindfulness offers heart rate and other biometric monitoring before and after your meditation sessions with a unique technology that uses your phone’s camera to take the readings. The app then uses these readings to develop a personalised meditation programme for each user. The app itself is free, but a subscription is required if you want to use it long-term. Calm offers a variety of programmes that focus on different aspects of your life. From ‘21 days of calm’ which focuses on bringing your meditation practice deeper, to guided meditations specifically designed for those who commute to work, or a week-long programme to help you sleep better at night, Calm has something for everyone. You can access the 7 Days of Calm and a handful of other guided meditations for free. A subscription is required for long-term practice. Based on the best-selling book One-Moment Meditation by Martin Borosom, this app sets out to prove that you really can make a significant change in your state of mind quickly. No matter how busy you are, you will always have a moment to do this one-minute, visually guided meditation. Completely free, this app can help recovering addicts get through those moments when cravings occur or they are met with an unexpected trigger. 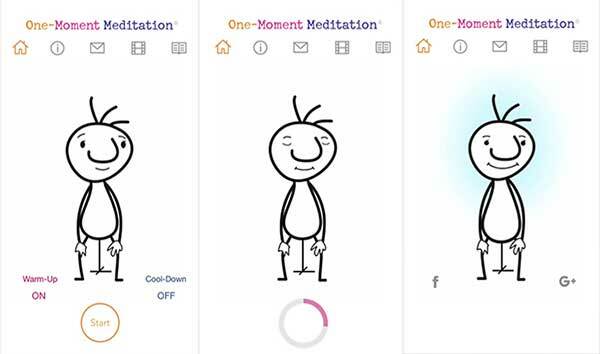 Meditation app Stop, Breathe & Think won the 2015 Webby People’s Voice Award for Health & Fitness with over 2 million downloads – which has to say something about its effectiveness. 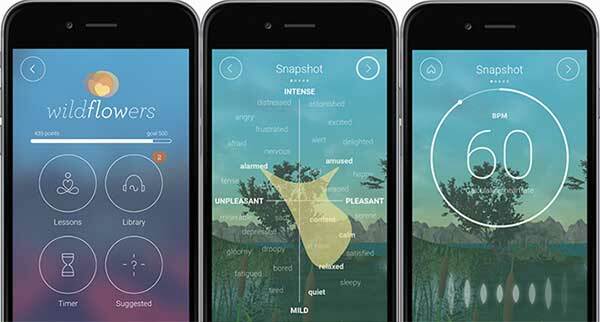 Not only does this app offer guided meditations with a variety of subjects, it also helps you get in tune with your emotions by prompting you to choose your mood from a variety of feelings before and after meditation – a great tool for those in recovery as keeping check of your feelings and emotions is integral in a successful, long-term recovery. It also includes stickers and rewards to help you track your progress. The one drawback from app, however, is that it can only be used when connected to the Wi-Fi. Free content is limited with optional paid meditations. This is only app on our list that requires an up-front purchase, but the good news is, there is no subscription fee. 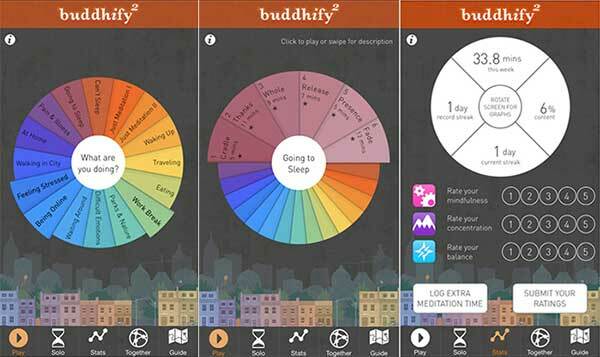 Buddhify offers an easy-to-use interface and over 80 guided meditations broken down into categories such as Going to Sleep, Can’t Sleep, Just Meditation, Feeling Stressed and more. With its one-time fee of $4.99 USD, Buddhify is very cost-effective and has many excellent reviews. Meditation is a personal practice. While one app may be perfect for one person, it may not work at all for the next. Many of the above-mentioned apps allow free trials, so the best way to see what works for you is to try them out for yourself! At The Cabin Chiang Mai, we combine mindfulness meditation therapy with cognitive behavioural therapy for a well-rounded and effective addiction treatment programme. If you or someone you know is suffering from addiction, or heading towards relapse, contact us today to see how we can help you get back on track.